Provision of Hope is TRAINING UP LEADERS at our Youth Center. 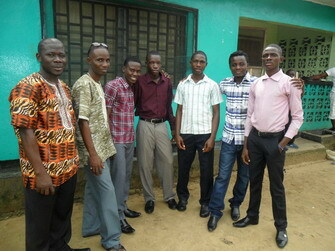 To date we have funded many graduates through some of the best universities and colleges in Liberia. Without a doubt, we need to see this generation of young people rise up to take a stand for justice. WE ARE RAISING UP CHAMPIONS!! Daniel Keamue is in the bright African shirt. He just graduated with a Bsc in Business Administration and Accounting. Daniel has been doing our accounting since 2005. He is our “live-in” dean. Daniel is a great example to the younger students. Daniel Coleman next, is a senior student studying Criminal Law. He founded the Community Tidiness Care which is a volunteer cleanup team that picks up garbage and tidies streets and back alley ways. Daniel is also on our Mercy Ministry Team taking care of widows and doing renovations in their rooms. That is our Mat to Mattress Program. Click on the highlights to see more on this. James Kollie is in Grade 11. He has been with us for several years. These boys all have a tragic story of their suffering through the war and losing their parents or being separated as they fled to survive. Some do find their parents alive or find relatives who are in the interior. Alex Gibson is in Gr. 10. He is a new student this year. See more on him here A Miracle Christmas He needs a sponsor. Amos Gaye is in Gr. 6. He came in very sick from a very deplorable situation. He needs a sponsor. Frank Julutoe is taking Architectural Engineering. He is a first year university student. Frank helps Pastor Malcolm in mentoring the high school students. Jeremiah Gaye is in Gr. 10. He was the young boy that was found picking up our garbage and repairing our shoes for school. Finally we had a vacant bed for him. He is the older brother of Amos. All our YOUNG LEADERS are up and coming CHAMPIONS! They may have been orphans of yesterday, but they are CHAMPION SONS TODAY!!! Christmas is fast approaching. We hope to buy new clothes for them. They desperately need new clothes and shoes. Yes, they look sharp on this photo, but you should see their clothes closets. You would take pity on them. Christmas Dinner $125 This includes chicken and jolef rice, with soda pop!! A BIG TREAT!! We have “really” cut down in our Youth Program, due to a lack of funding. My prayer is that more people would see the need to help the youth to go forward. They do need to be educated beyond high school. We have no problem finding sponsors for children, but many like to quit after their child reaches Gr. 12. That is only phase one. We must go on to see these young people LIVE THEIR DREAM! Provision of Hope runs a strict program. We screen those we accept into our Youth Center. We are raising Champions!! By the time they are through our doors they are young men of integrity with solid Christian values. 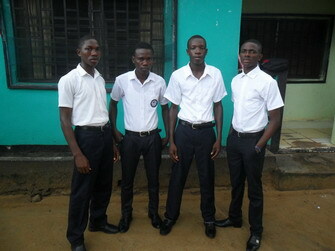 They are role models for the youth of Liberia. These are the ones who will change the face of Liberia. Everyone of our students are volunteering in some way to help their communities. Please join us in prayer, that we can keep our Youth Center going. To do that we need people who will help us fund this program. If you would like to see our financial statements on this project, I would be glad to share that with you. Each resident at our youth center, costs us $100 per month. This is the cost for food, medical, transportation. This does not include education or rent for the house. We could house 5 more students if we had the money. This is the first year we have only 7 residents. This is a big house, and we could take in more. Two of our students have gone to Kenya for Training in Organic Vegetable Gardening. They will be home shortly, then they will help us train others in this field. God bless you this Christmas! !